Do you find yourself eating a lot on the fly? Eating at your desk in that quick 15 minute break you have? Eating in the car while you race to your next errand? I’m getting some insight about mindful eating from the book The Slow Down Diet by Marc David. I love what I’m learning. I have been learning some important lessons about slowing down in my life so the title of this book intrigued me. So far it doesn’t disappoint. It boils down to this: Our bodies are designed and work best when we eat slowly. Yep, even eating the most amazing good for us foods might not make a difference if we’re eating fast. Seriously? This seems like cruel news to me, how about you? What helped me to understand this concept as it relates to food is by looking at the opposite dynamic. When we are stressed, anxious, and moving fast, our digestive system shuts down. SO, if we are eating when in this emotional state, the body cannot make the best use of even the most nutritious food. 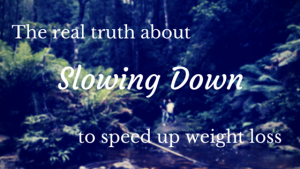 So how on earth do we slow down? Breath—By taking 3-5 slow deliberate deep breaths before we eat, we can help our digestive system to wake up and get ready to do its work. Linger—By lingering over a meal, we can be really in tune with when we are sated. When dining out take your time, choose places that are relaxing to you. Savor—By savoring our food like a French person and tasting every bite, we give our body time to register the great food and digest it properly. Enjoy—By enjoying our meal with in a pleasurable environment even if we are eating by ourselves, we are taking care of ourselves by nourishing with more than just food. Try this and see what the outcomes are for you. I know for me, I have been enjoying my food immensely, been more aware of how it feels in my body and am more of aware of when I’m sated. I don’t crave foods as much as I used to. My body and brain and soul remember how well I took care of it yesterday, so my body and mind trust that I’ll do that for it again today. It’s calming. Having trouble slowing down? Have more questions about weight loss coaching? Sign up right here for a Power Mini Session to get some real tried and true tips to get started. See you Friday with a special announcement! !